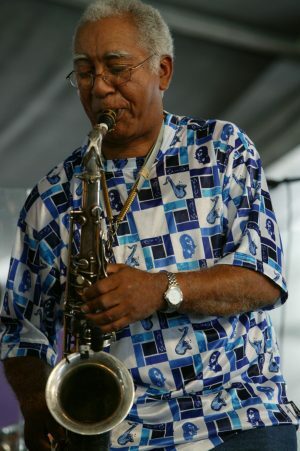 Longtime New Orleans jazz saxophonist and educator Edward “Kidd” Jordan has been named Artist in Residence Emeritus by the Kate Schulte Foundation. The foundation, named in honor of the late civil rights attorney and activist, “is dedicated to furthering the cause of equal justice, equal rights, and equal opportunity for all through the arts.” In his new role, Jordan, who has already led tributes to Schulte at the 2012 and 2013 Hot Times Festivals, will continue to do so annually, along with presenting local educational workshops. He also hopes to bring additional jazz concerts to Columbus in an effort to expand jazz entertainment and education opportunities. The Kate Schulte Foundation is pleased and honored to announce Edward “Kidd’ Jordan is their Artist in Residence Emeritus. The New Orleans jazz patriarch has been awarded this residency in recognition of his lifetime of contributions to society and to the New Orleans community through his contributions in both jazz performance and jazz education. He will participate in the Hot Times Tribute to Kate Schulte in Columbus, Ohio, each fall, performing at the Hot Times Festival and presenting workshops in the area. As a performer, Kidd Jordan has not taken the easy road. He has espoused an “outside” improvisational style that can be daunting to the casual listener. His work is rooted firmly in the jazz tradition with a foundation of extraordinary technique. Reminiscent of Coltrane at his peak, Kidd’s performances range from powerful to tender, sometimes in the blink of an eye. Consistent with the Kate Schulte Foundation’s motto, Art for Justice, Kidd has written and performed thematic works around social justice issues including Palm of Soul, recorded shortly after Hurricane Katrina. A track from this album was used in the television series Tremé, in which Kidd appeared in two cameos. The list of musicians and singers Kidd has performed and recorded with is long and replete with the cream of jazz, soul, R&B, and even rock. From Aretha Franklin to REM, Cannonball Adderley to Ornette Coleman, Ray Charles to Sun Ra, Kidd has performed with the Who’s Who of music. He was an influence in the beginning of the Dirty Dozen Brass Band and a major force in the formation of the World Saxophone Quartet, both of whom he has performed with. With Alvin Fielder and Clyde Kerr, Jr., he formed the Improvisational Arts Quintet. Kidd Jordan has a long and abiding commitment to jazz education and many of today’s top jazz musicians including Terence Blanchard, Marsalis brothers, Marlon Jordan, Nicholas Payton, Trombone Shorty, and many others have benefited from his tutelage. He helped start the Heritage School of Music and was its director for many years. He was a professor a SUNO for decades until his recent retirement. He also taught at NOCCA (New Orleans Center for Creative Arts. He is the artistic director and curriculum coordinator for the Louis “Satchmo” Armstrong Band Camp. Kidd is considered one of the world’s top jazz educators and has been profiled on 60 Minutes for this work. His deep and abiding commitment to jazz education is a reflection of his belief in the power of music in society. One of the essential lessons he teaches is to play what you feel and what you hear. Kidd has been honored with a Lifetime Achievement award from the Vision Festival, the Jazz Journalists Associations “Jazz Hero” award, Offbeat magazine’s first Lifetime Achievement Award for Music Education, and the French Ministry of Culture’s Chevalier of the Ordre des Arts et des Lettres. The Kate Schulte Foundation honors civil rights attorney and activist Kathaleen B. Schulte for her commitment to social justice and community. The slogan “Art for Justice” reflects her involvement in these issues and her abiding love of the arts and especially music. A perennial volunteer at the Hot Times Festival in Columbus, Ohio, the festival honors her commitment with a tribute concert each year. Kidd Jordan has performed with The Jazz Poetry Ensemble at each of the first two concerts, joined at the inaugural concert by jazz great and friend, D.D. Jackson and at last year’s performance by son Marlon Jordan. Kidd became friends with Kate Schulte when she helped bring him to Columbus in the mid-90s for a performance at K2U. He participated in workshops with area students both years. The foundation hopes to expand the workshop offerings. The Kate Schulte Foundation helped present Kidd Jordan in June of 2013 with the French American Peace Ensemble also featuring longtime collaborators Hamid Drake and William Parker and French musicians Louis Sclavis and François Tusques. The foundation also helped present David Murray with Macy Gray at the Shadowbox Theater in Columbus in August 2013 and has supported the Ray Charles Tribute Band with Roger Hines. The Kate Schulte Foundation gratefully acknowledges the support of the Puffin Foundation West and WCBE. For more information on the Kate Schulte Foundation, visit http://www.kateschultefoundation.org/ or contact via email at info@kateschultefoundation.org.